My fascination with the Ennebi brand continues with my third Ennebi purchase. Damn, this is becoming an obsession! No! It's a hopeless addiction. And it doesn't help that the pusher is constantly feeding this junkie with teasers. When Anders informed me that he had just received one piece of the GFB, the insatiable urge for more Florentine drug got the better of me. Thus, another parking lot in one of my 18-slot watch case gets another permanent tenant. 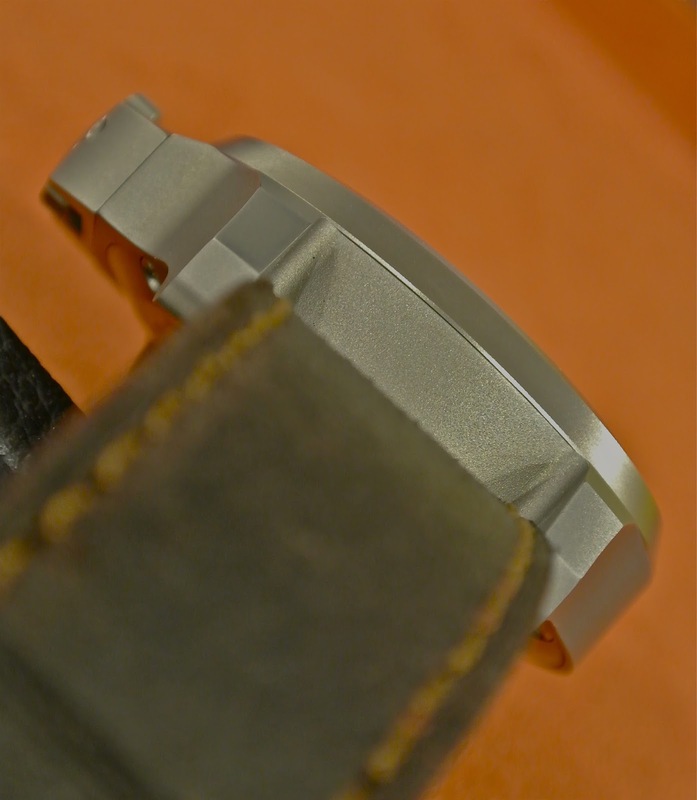 The GFB comes in a 47mm grade 5 titanium case, fixed bezel and acrylic crystal. Encased within within this chuck of titanium is the widely used ETA 2824-2 calibre. It is depth- rated to 1000m and like all its stable mates, there's no HEV. This particular unit comes with a dark mocha dial. Like all its siblings, this case is rather chunky. The lugs are steeply curved with rounded ends. The straps are held in place by screwed-in bars. The over-sized crown is a joy to operate. What really drew me to this brooding beast are its aesthetically clean lines and industrial-grey sheen. The broad shoulders that guards the crown further enhances its clean, industrial looks. 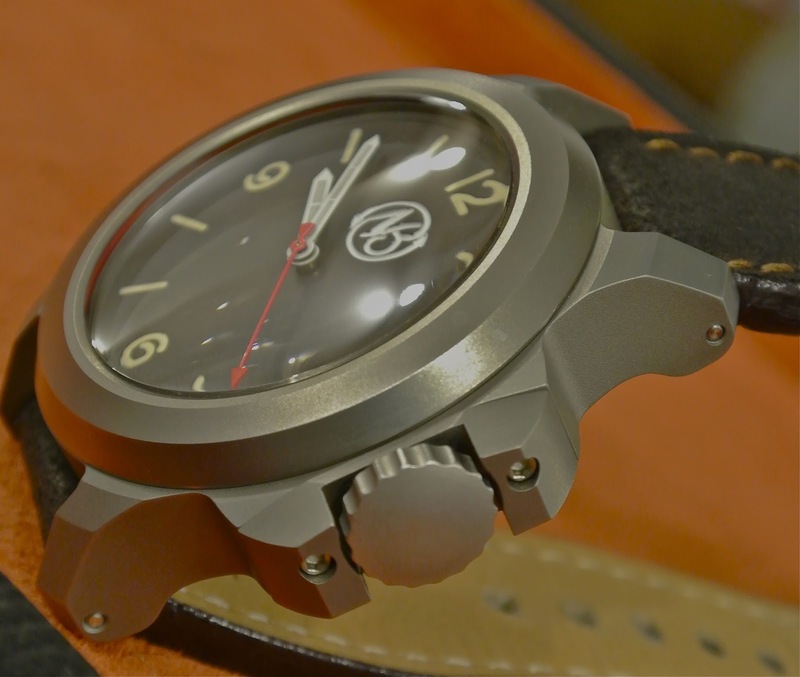 This gem is really the very epitome of precision engineering in watchmaking. Every time I look at it, it never fails to remind me of some kind of mean and purposeful industrial machinery. Even a armoured military vehicle. A tank, to be precise. The inscription on the case back further strengthens its industrial image. However, there is one major gripe. Although it comes with a painted Italian flag to stamp its Italian heritage, the green paint on the flag started to smudge after a few days of wear. I have informed the folks at Gnomon and they have, in turn, notified their Italian principal. Now the wait begins for a solution. Like all Ennebies, this industrial warrior comes standard with 2 pairs of Mario Paci calf leathers, each fitted individually with Ennebi's signature engraved roller buckle in titanium. The buckles are fitted to the straps by hex screws. Not much I can complain about the neon-bright lume dial. I really dig the turquoise glow. On the wrist, it's a real comfort. Thanks to a large part, the steeply curved lugs. It wraps around my flat 6.75-inch wrist like seaweed on a California roll. 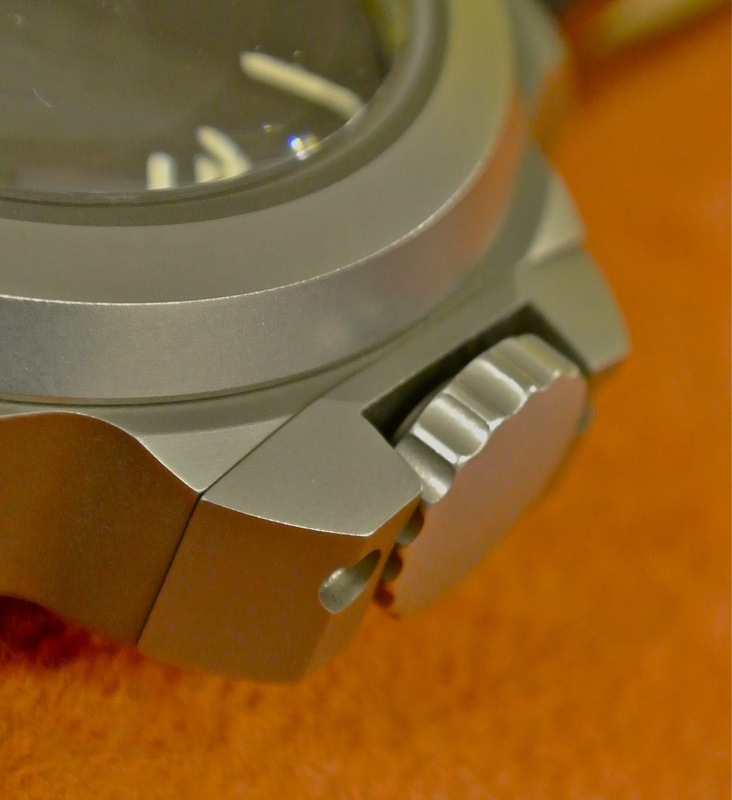 The curved lugs also ensures that there is hardly any overhang when worn on a small wrist like mine. There is really nothing much I do not like about this baby. It's clean, precise simplicity really speaks volumes. There is no wonder there is a long wait list of Ennebi's offerings. When I bought my first Ennebi, a couple months back, I was warned by current owners, enthusiasts and Anders that it's a downward spiral with no u-turn in sight. I shrugged it off. But now, I've learned the hard way, one should set up a half-way house for Ennebi-addicts, or at least an AA-like help group! Case Material : Grade 5 titanium. Power reserve : +/- 40 hours. - Surgically precise finished case. - Nice case colour and design combo. - Curved lugs with little overhang. - Relatively high price tag. - Scarcity and long wait list. - Smudged paint job on case back. The shoddy paint job is inexcusable. Even on the dial too? Yeah. But am glad that Gnomon has already taken immediate action by contacting Ennebi as soon as I showed them. But the problem is t Ennebi takes forever to reply to them. The dial is ok. The smudged paint job is limited to the Tricolore. That's good to hear. I hope this gets rectified soon. Do post updates! Hi Richard, with your ample fire power, would you go to Ander's store and check out the UBoats, especially the U42 in Titanium and give us a review? I purchased a Dievas 3646 from Ander before as well, really like they way he does business and his products. firepower? me? i reckon i fire blanks only haha! I won't loan unless I really have no choice. anyway, I prefer to review my own watches to ensure no bias. And it's not really nice to loan one just to do a review. I've only borrowed the bronze steinhart and the squale classic nos so far. ANd yes, Anders is a great chap. Haha! I bought another one about a month ago. Will do the review soon. I made a vow that would be my final one... i think?